Below is the content of the proposal from the Forest Hill Society to Sir Steve Bullock regarding bringing swimming back to Forest Hill as soon as possible. A sketch of the proposals for the site can be viewed here. We have given careful consideration to the various options that are around about the use of the existing pools site and the alternative site at Willow Way. We are concerned that the potential of achieving planning permission is not being realistically stated and that alternative options for funding a pool, on the pools site, are being ignored. Firstly we are concerned that the potential of achieving a pool on the Willow Way site is being overstated generally and particularly in the current consultation. A pool on this site is strictly speaking contrary to the UDP and a leisure use does not meet many of the criteria set out as mitigating reasons why non-employment uses would be considered. Pushing ahead this option could be problematic for the council. Legal guidance has already stated that residential would not be allowed on the Willow Way site and such an option has been removed from the consultation, however, it remains questionable whether a swimming pool would be suitable for the location. As well as resulting in a loss of employment, moving the swimming pool from the Dartmouth Road site would also be contrary to regional policy intended to retain leisure uses in town centre locations. This location is not recognised as meeting most of the criteria for the location of a swimming pool – specifically it is outside a designated town centre and is not correctly located to provide the maximum level of access to swimming within a 20 minute walk from their homes. 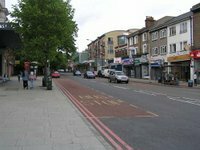 The location is within a 20 minute walk from the Crystal Palace pool, which means that half the catchment area is already served by another pool. This calls into question the long-term viability of this site for leisure use. There is a similar planning problem when considering the loss of a pool and park from Dartmouth Road for conversion to residential. This will have a detrimental effect on the town centre and specifically on the library, which will no longer be adjacent to a leisure destination. This will again require a major change of use of the land, and with the density of housing proposed, close to existing housing and two grade 2 listed buildings, is likely to meet resistance from local residents. We understand the financial problems that you have in providing the pool on the existing Dartmouth Road site but the Forest Hill Society have been working on a proposal for Live/Work development to cross-subsidise the pool on the existing pool site. The would comprise approximately 50% live/work units providing 25-30 jobs, and just under 50% residential units above the live/work units. We believe that this option will maximise the employment available on the site (greater than for the likely use of the site for pure employment as either B8, B1, or B2, or for the pool). However, we recognise that this does not fit with the 100% employment use that is outlined in the UDP and in the draft core strategy options produced in 2009, although it does achieve the objectives for flexible, creative employment accommodation. The use of Willow Way as a mixed site for employment and residential is actually a very good use of this site that assists with the regeneration of the area, maximising employment (and possibly a small amount of residential use), whilst maintaining additional employment in leisure services at the existing pools site. It has to be done in the right way to create a viable live/work community, but the residential element will positively assist in this desire. We recommend that the council consider the Wilow Way site as a suitable site for mixed use development, allowing such a development in the south of the borough as well as a number proposed for the north of the borough. This is the best use for this site independent to any consideration of the pools location. There should not be any significant problem in designating Willow Way as a mixed development in the Core Strategy and Spatial Strategy that are being produced and this would allow for the building of live/work units plus residential on Willow Way in the same timeframe as the alternative idea for housing on the existing pools site. The council should then be able to move forward with plans for the development of the new pool on the Dartmouth Road site, knowing that approximately £2m can be realised from the sale of the Willow Way site (our conservative estimates show a minimum of £1.5m land value based on 2009 property values). 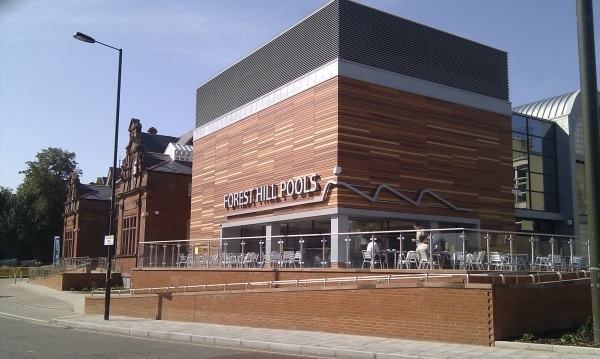 Unfortunately Willow Way cannot completely cross-subsidise the estimated cost of the pool if it does cost £12.5m, with a shortfall of £5m from the funds the council have earmarked for the Forest Hill pool. We believe that most of the remaining £3m shortfall can be addressed by the reduced cost of building over that last two years, and by careful consideration to reduce costs on the site. The current plan for option 2 is to push ahead with building a pool on the Willow Way site prior to approval for building housing on the existing site. We believe that if this can be done for option 2, a similar process can be put in place for option 1, allowing for the building of the new pool on the existing site to commence in the same time frame. 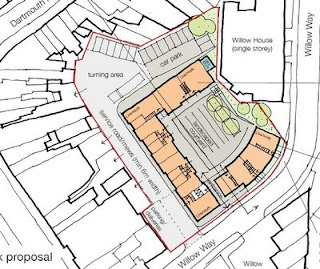 This option, of pools on the current site and mixed use on Willow Way should result in less risk to the project as a whole, by a minor and justifiable change to the designation of Willow Way, rather than significant changes to the designation of both sites of proposed development. This will provide for swimming facilities at the earliest possible opportunity in a site favoured by residents, planning and leisure guidelines, and by council officers to whom we have spoken. We believe that an Outline Planning Application on this site may be a good way of testing and determining the future of the Willow Way Site and would be happy to help you wherever we can in the preparation of such an application. I look forward to your response on this proposition.